Your New Year’s Resolutions? They’re just not gonna happen. I’m not fond of New Year’s Resolutions. I never make New Year’s Resolutions, and with good reason. Every year-end, about 50% of the US population makes New Year’s Resolutions, hoping to accomplish everything from weight loss to debt repayment. Yet, only about 8% of resolution-makers actually fulfill their New Year’s resolutions. The reasons for these failures are many, but one of the main problems with New Year’s Resolutions is the lack of planning involved in making them. When people do make a plan, it’s often not well designed. And when it is well-designed, there’s often a lack of commitment to making it happen. While fulfilling these resolutions would be wonderful, the way in which they are written makes their accomplishment highly unlikely. Enter SMART goals. Turning New Year’s Resolutions into SMART goals will help you to be more deliberate in their pursuit. SMART stands for specific, measurable, achievable, relevant, and time-bound. This goal is specific (5 servings of fruits or vegetables). It’ measurable–you can write down your fruit and veggie intake in a food journal. It’s achievable–with a little planning, you can easily fit in 5 servings of fruits and veggies each day. If your goal is to eat better because you feel that your diet needs improvement, this goal is relevant to you–eating more fruits and vegetables will make your diet healthier. And finally, this goal is time-bound–you’ll be working on it for 5 weeks, and you can then check your progress at the end of that time period. You can also check you progress along the way to the end of those 5 weeks by using process goals—in other words, breaking your goals down into smaller chunks and checking off boxes along the way. 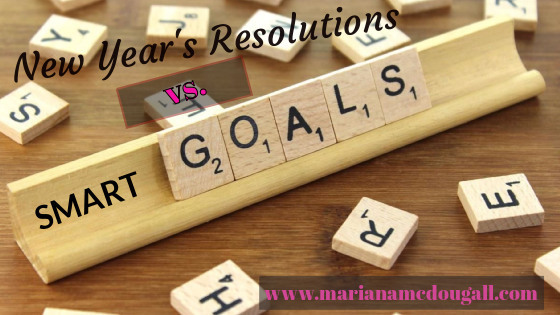 The majority of New Year’s Resolutions fail because they’re too focused on outcome goals rather than process goals, and their timeline (if there is one) is far too long to be significant. Whereas long-term goals are important, you can’t accomplish them unless you break them down into more manageable steps (in other words, process goals). Rather than thinking about the whole year ahead, think about weekly and even daily goals that you can set, which will then inch you closer to that final outcome (in this case, “eating better”). In the example we’re using, a weekly goal may be to create a meal plan for the week ahead, which includes 5 servings of fruits and veggies in each day’s plan. A daily goal may be to prepare the next day’s snacks (consisting of fruits and vegetables) the night before, so that you can quickly grab containers on the way out of the house, and know that you’ll be able to accomplish that day’s goal (eating your 5 servings). Once you’ve decided on your weekly and daily process goals, writing them down and checking them off can help you continue to work towards achieving your outcome goals. Tools that can be helpful include a worksheet like the one you get by signing up for our mailing list, or an app like Home Routines. I use this app daily and love it. I mostly use it for chores; however, you can also set weekly and daily goals about anything you want. So, this new year, don’t make resolutions. Set goals. Starting with your why can help. Start with the most important things in your life. Consider making a life plan . It’s always easiest to stay on track with your goals when you know why they’re important. What SMART goals will you set this year?